Timely,Preplanned or has the same email (below) being dropped into the receipients ‘IN-BOX.” There are many unanswered questions within this political ‘imbroglio‘of Saratok which the Barisan National Hierarchy needs to addressed and to seek the HIDDEN TRUTH. This appeared in the local daily but it was a denial by a senior vice president of PDP. The best part of it all is that it says,” Igai said it was quite a norm in politics that one could have been a member of another party, be it in the ruling or the opposition, before joining the present party. “From what I know, Basil was once from the other side of the political divide, but it was over 10 years ago. SURELY, this picture we received is not EXACTLY 10 YEARS AGO. Could this be photoshopped by someone? This is indeed a serious matter for BARISAN NASIONAL and the very reason that many seats were lost in the previous elections were partly due to internal sabotage and also leaders being led by ‘favouritism on the part of reports submission and integrity. This ancient proverb holds some truth now,”The enemy of my enemy is my friend.” which suggests that two opposing parties can or should work together against a common enemy. Who is the PDP common enemy now? BN has an incumbent and sitting MP now unless there are very “WILD RUMOURS” he is not a Barisan Nasional Man. Did PDP check this out? BN knows that this seat must not be compromised and with the track record and impeccable service to the rakyat by the Incumbent they will find a solution and the CM and PM knows best what to do. Aren’t they others in the PDP closet than these 3 which are already tainted even before GE is called? BN will not have any sleepless night knowing that their Incumbent MP will not be “BULLIED INTO SUBMISSION” BN will stand by their loyal friend and maintain this safe seat. BARISAN NASIONAL WILL SEEK THE TRUTH AND WILL NOT COMPROMISE A SAFE SEAT. On behalf of audie61 we would like to thank Datuk Patinggi Tan Sri Alfred Jabu for his selfless service to the State of Sarawak. Two Senior BN Ministers helming friendly BN parties seems to be constantly attacked by their former colleagues in Barisan Nasional Sarawak. Are both of them the real enemies to BN? If audie61 may, the writer wrote this or have been told by his sources,”Perhaps he thinks Teras can hit out at any BN leader except Adenan. Perhaps everybody else in BN is not important except Adenan. Was this recorded or was it just passed through word or mouth which was also a statement against a Senior Minister in James Masing. This is political allegation of the highest degree to defame and “profile” another Senior Minister’s Men when he spoke in Meluan. During the PBDS struggles the BN symbol in 1991 was shared equally amongst the 8 seats two factions. The writer knows perfectly well on this matter. In our previous article we wrote and we publish the link for him to read,” https://audie61.wordpress.com/2015/10/07/no-clear-line-in-politics-theory-yes/ By the way we did say we did not stalk his writing didn’t we.? Unfortunately for him his SUPP boys seems to like to tag people in FB and this appeared constantly and there was no way it could hide in cyber space. Its also so coincidental that a TERAS SC member called us to remind them on the Prime Ministers statement and publication. This of course was even before the extracted article below went on cyberspace. 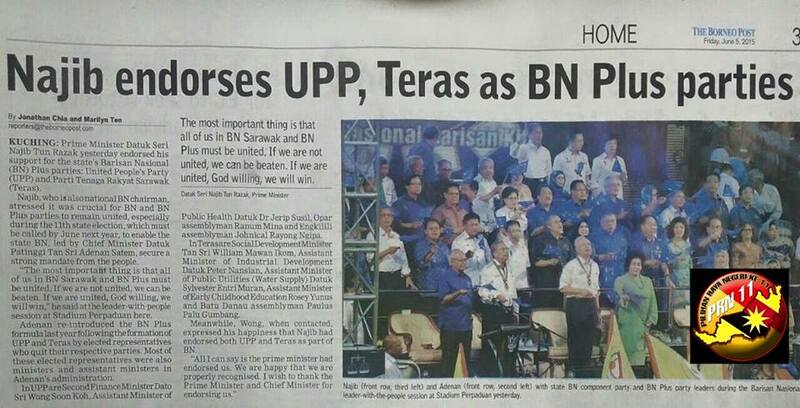 PM endorsed Teras & UPP at June 3rd BN rally at Stadium Perpaduan Sarawak. Some one must have forgotten that Najib Razak is still the Prime Minister or is someone in the BN party not telling us something? Did Borneo Posts get it all wrong or there is a conspiracy which Adenan should know? We know,politics is so fluid and political parties can choose whether they want to opt out or be in a coalition. Surely,Mawan and Wong are very much part and parcel of the BN government and they are serving under the administration of Adenan’s government. We can also say that its not Adenan’s government as he inherited from Taib Mahmud midstream. Adenan have made it clear that he would not change the cabinet midstream didn’t he? Does that sound familiar? Did he or did he not say that we may ask the leaders from PRS,SPDP or SUPP or even his own party PBB? Adenan could have drop anyone and pushed his friend as many would know William Mawan up as Deputy Chief Minister ahead of James Masing. Did he ? No,he didn’t and this allegation of him having a soft spot for Mawan is thus untrue. Still,stop this harassment and untruth against both these leaders. By the way, am not siding with any of the leaders or audie61 would have losts all relevancy. Whatever happens in the Supreme council by the Presidents of the party remains and they need to bring it to the BN supreme council meeting. If there are uncertainties or disagreements one should sound it up between the BN leaders inside the meeting. Why are they harping it outside and in the mass media as if Wong and Mawan are TRAITORS to Barisan Nasional. They are not Pakatan MInisters in BN Government are they? Does that sound logical? Certainly, it does then to fight against each other claiming who can do this and do that. UPP and TERAS are very much part and parcel of BN Government whether the other parties in SUPP,SPDP or PRS like it or not. Adenan have kept his words not to disrupt anything before the State elections and let’s leave it to him to sort it out. It’s easy to see why Wong Soon Koh is such a confused person nowadays. United People’s Party (UPP), which he leads, is not a member of Barisan Nasional (BN) but he is a minister in Chief Minister Adenan Satem’s BN Plus government. The dividing line is razor thin, any man in his position, being neither here nor there but everywhere, would tend to overlook the fact that he is only a minister in the BN Plus government, which does not make him a member of BN. To be a member of BN you have to belong to a party that’s a component of BN. In Sarawak, it means you have to be a member of any one of the four parties namely, Parti Pesaka Bumiputera Bersatu (PBB), Parti Rakyat Sarawak (PRS), Sarawak United People’s Party (SUPP) and Sarawak Progressive Democratic Party (SPDP). If you are not a member of any one of these four parties you belong to the Opposition; or at best you can claim to be friends of BN as in the case of Wong and UPP, and William Mawan and Parti Tenaga Rakyat Sarawak (Teras). But the problem with Wong and UPP is they say they are friends of BN but they are all out to deprive SUPP of its traditional seats. Similarly, Mawan and Teras also claim they are friends of BN but they are no friends of SPDP. Everybody knows they want to force SDPP out of BN and take over. They even criticise Dr James Masing, the president of PRS, the second biggest party after PBB in the Sarawak BN, for telling them they should be brave enough to use their own symbols in the coming state election. Even little known grassroots leaders of the party show no respect for the senior members of the state BN, saying they have every right to talk like BN does. What the guy didn’t realise was he was speaking against Masing. Perhaps he thinks Teras can hit out at any BN leader except Adenan. Perhaps everybody else in BN is not important except Adenan. Why only Adenan? Because Adenan is the all-powerful? Because it is up to him to decide if you get to stand on BN ticket? Because it’s up to him to say Teras and UPP are in a special position where they enjoy better rights than PRS, SUPP and SPDP? Such a statement against BN leaders and coming from people who are not BN members is not only being disrespectful but also being ignorant of how the BN system works. Who says Teras is not desperate? Is there anyone in UPP who dares say UPP is not desperate either? The state election is likely to be called within the next six months, let’s be frank about it – Teras and UPP are desperate about being admitted into BN because they know they can’t even win a single seat if they use their own symbols. Without the ‘dacing’ symbol, Mawan cannot win Pakan and Wong will lose Bawang Assan. They know it, which is why they will be lying if they say they are not desperate. When the chips are down your true friends will stick together with and by you. When good times roll the friends who are now enjoying the fruits of your labour will be dealt a BAD HAND in time to come if they conveniently forgets you. Whatever comes around will go around and that is the basic understanding of how karma, the law of cause and effect, works. 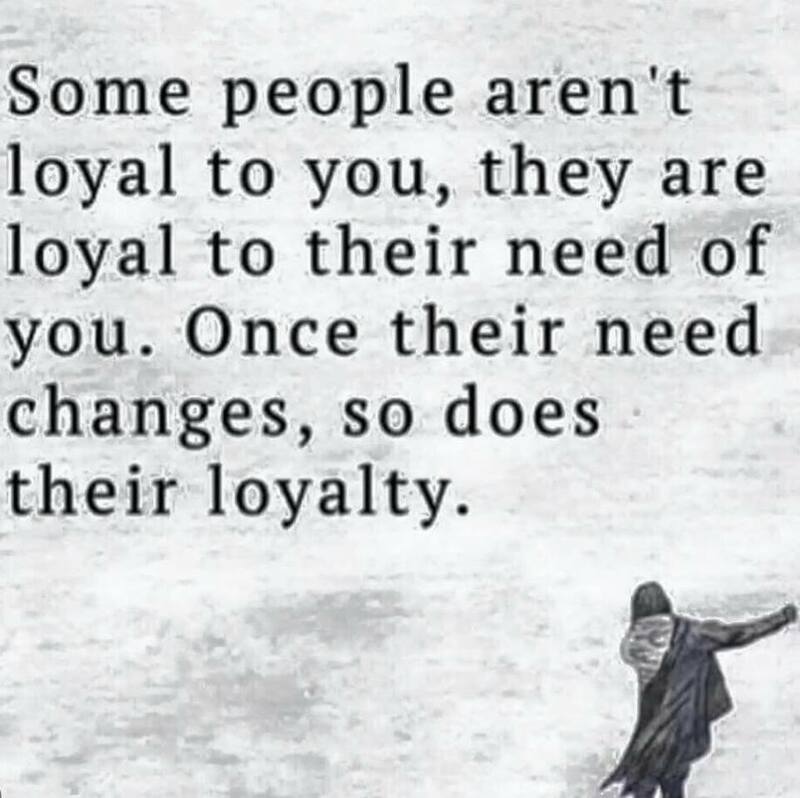 My friends become your friends and your friends too will back stab you. An enemy will never even get near you. There is still a flicker of hope and this is dedicated to the friends who have betrayed my trusts. BEWARE YOUR TIME WILL COME. Tan Sri Dr James Masing doesn’t want to hear of another Bible-seizing incident. “I don’t want to see or even hear of another incident involving the seizure of our Bibles. 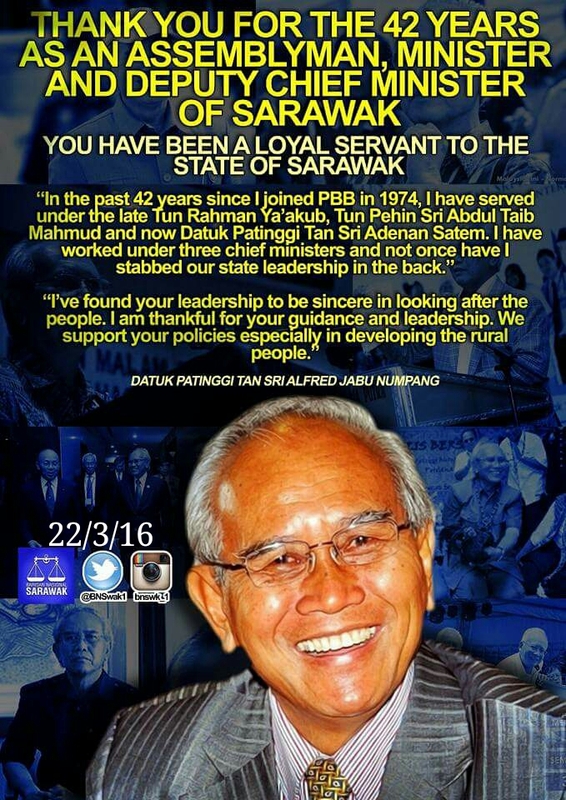 Don’t let it happen again,” the outspoken Land Development Minister from Sarawak told theantdaily. He was commenting on the return of the seized Bibles today to the Association of Churches in Sarawak which signalled an end to the religious saga that hogged the nation since January this year. The release of 321 copies of the holy book, however, came with two conditions; one, that they are not to be distributed in Selangor, especially among Muslims, and two, they are only for Christians in Sarawak. Nevertheless, for Christians throughout the country, news of the release of the Malay and Iban-language Bibles was a welcome relief. Arguing that the seizure was illegal in the first place as it went against the Federal Constitution, which guaranteed freedom of worship, Masing felt that some overzealous officials had gone overboard. “It’s illegal in the first place…even the AG has ordered the Bibles to be returned. They should not have detained the holy book until now,” he said. The minister appeared upset with the conditions that the Iban-language Bibles should not be distributed in Selangor and could only be used in Sarawak. His concern is understandable as there is a sizable Sarawak population in Selangor who are Christians. And this group has been using the Malay and Iban-language Bibles. So what happens to the thousands of Sarawak Christians residing in Selangor who have all along been using the Iban-language Bibles? The controversy began in January this year when Selangor Islamic Religious Department (Jais) officials seized the Bibles from the Bible of Society of Malaysia (BSM) on grounds that the Bibles violated a 1988 Selangor enactment which prohibited non-Muslims from using the word “Allah”. The Bibles were handed to the chairman of the Association of Churches in Sarawak, Rev Archbishop Datuk Bolly Lapok, in a simple ceremony at the Istana Alam Shah in Klang witnessed by Selangor Sultan Sharafuddin Idris Shah and Menteri Besar Azmin Ali. After the ceremony, Azmin had twitted that an “amicable solution” had been reached. Unlike his predecessor, Tan Sri Abdul Khalid Ibrahim, Azmin had taken a tougher stand and stood up for the Christian community, arguing that the Bibles did not belong to the Muslims and therefore should be returned to the Christians. His remarks were welcomed by the Christian community. The MCA, meanwhile, in urging Azmin to ensure there is no repeat of the fiasco, regrets the condition which prohibits the distribution of the Iban-language Bibles in Selangor. The party’s Syariah Law and Policy Implementation Special Task Force chairman Gan Ping Siew questioned how Sarawak and Sabah Bumiputeras working in the armed forces, police force, civil service or studying on the peninsular alongside with Orang Asli Christians whose first language is Bahasa Malaysia would refer to their scriptures. He called on state governments to look into the relevant provisions in the state enactments to enable Malay-speaking Christian Bumiputeras and Orang Aslis to have access to Bahasa Malaysia or native-language versions of the Bible in their homes and places of worship in the peninsula.